Dedication: This blog post is dedicated to one of my most avid blog readers, Uncle Joey. After not speaking for almost 2 years due to the "popcorn mishap," I am so glad we are friends again. BFFs, in fact. And once again, I am really sorry, but in a shallow way. On to NYC and EATALY! Being a Jersey gal, going into NYC for Christmas is something that my mom and I have always loved to do. So we took a trip to NJ to visit the fam this past weekend, and managed to spend a day in the city as well. First stop? 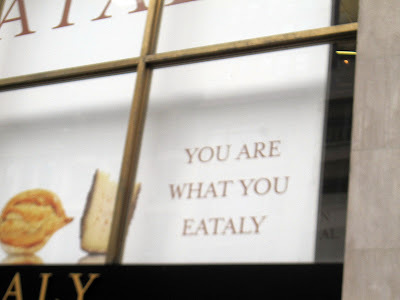 EATALY! 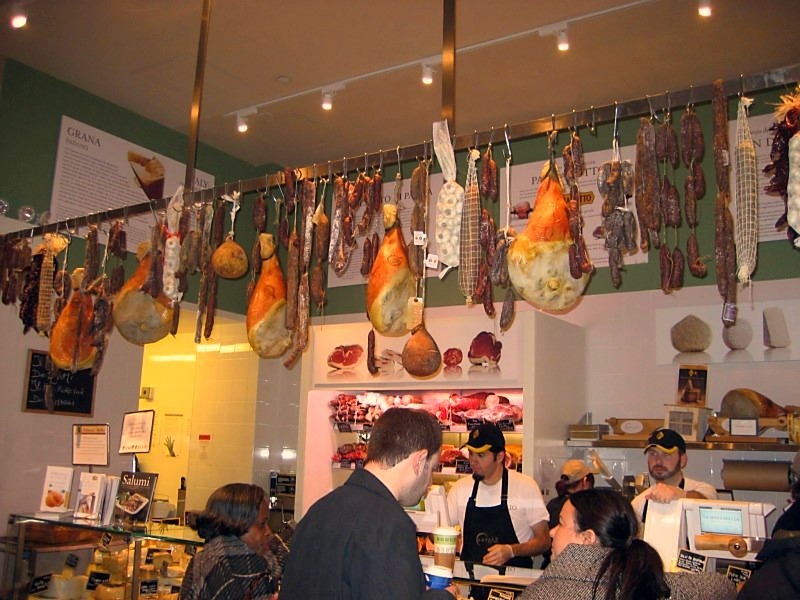 EATALY is an enormous Italian market located in NYC. It takes up one city block! Eataly was started by famed Italian chefs Mario Batali and Lidia Bastianich, and is based off of the Italian markets in... Italy. Duh. There are several different restaurants in the market, fresh meats, cheeses, veggies, fruits, etc. I was seriously in "mangia" heaven. The market opened in August of this year, and the crowds had NOT subsided. It was totally worth it! 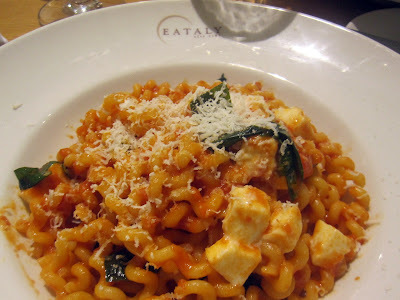 Let me take you on a tour through EATALY! 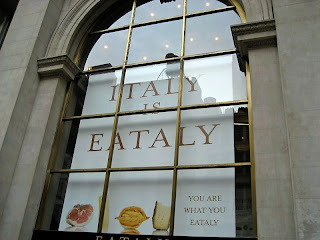 Below is the front of Eataly where we waited outside for 10 minutes like total tourists to get in. I am obsessed with their slogan and have said it probably 90 times since this weekend, even at times in the conversation where it makes zero sense. 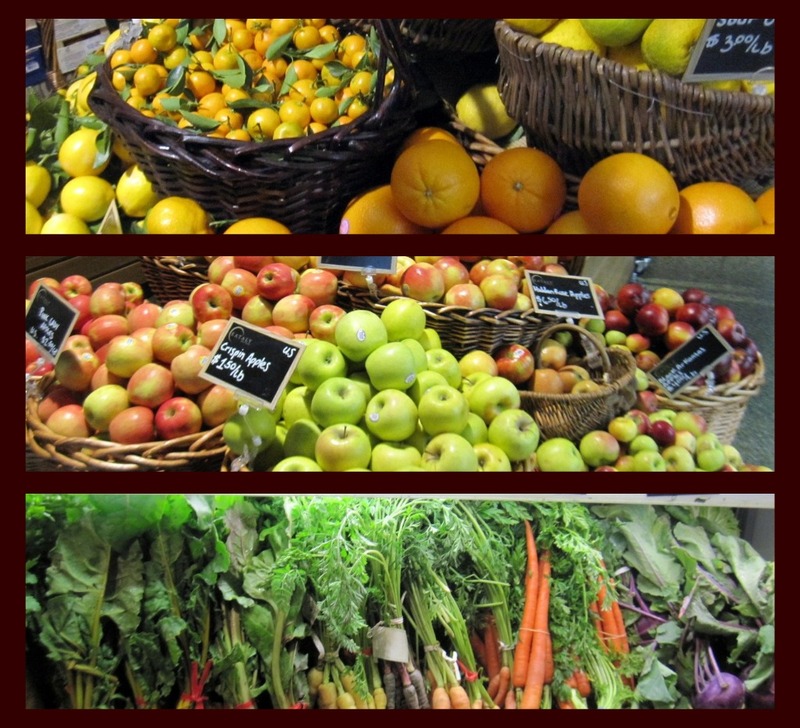 We walked through vibrant displays of vegetables and fruit for sale. Gorgeous! Big loaves of crusty bread, fresh meat and seafood, and delicious cheeses all had their own section in the market! Check out the shelves upon shelves of pasta and olive oils. Plus, freshly made pasta in a case. 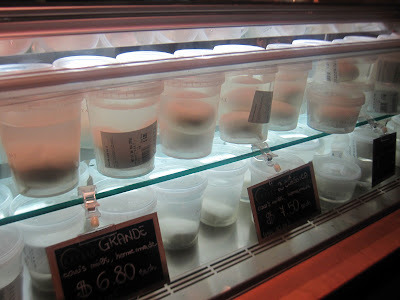 Buffalo Mozzarella, or "Wet Cheese." This "wet cheese" phrase comes from my best friend Kalle. When I first moved to North Carolina from NJ and met Kalle, my family had her over for dinner. We searched long and hard for some authentic buffalo mozzarella in NC! Kalle, a born and bred Carolina girl, innocently asked "Why is your cheese wet?" We got a kick out of that. Hi K! See how we crammed our 9 person party into the tiny table! We had to keep wine bottles and water on the floor to make room for all our FOOD. My pick for lunch? Fusilli Napoli.... Fusilli pasta with red gravy (tomato sauce) and fresh mozzarella and basil. I am still thinking fondly about this meal as it was one of the best pasta dishes I have ever had. If I lived in NYC, I would weigh 300 lbs because I would be eating Fusilli Napoli for breakfast, lunch and dinner. Eataly was definitely a tourist trap, but I don't care. It was fun and delicious. Plus, our waiter looked exactly like Mario Batali, so that just added to the experience. Moving away from Italian, and on to the beautiful windows at Saks Fifth Avenue. The windows were not as Christmas-y as I remember, but instead focused on high fashion and New Years Eve celebrations. I LOVE this idea for a New Years Eve party. If you look closely (click on the image to get a larger picture) on the champagne bottles, they have spelled out words like "Cheers" on the bottles with bedazzled lettering. It looks fancy and festive and really makes the bottles part of the table decor. Another thing Saks Fifth Avenue tried to do was scare the **** out of me by having this creepy doll in almost all of their window displays. Can you say Bride of Chucky much? And finally, we braved the crowds to see the beautiful Rockefeller Center tree. See the crowds on the left, and the tree on the right. The crowds were panic attack worthy, but it's so fun to see the tree! On this trip, I laughed, ATE and had a blast with my family being a fantastic NYC tourist. I should really just have I Heart NYC tattooed on myself. Thoughts?! Oh Jackie- I love Eataly too!! My favorite favorite client is a tiny artisan salami company (Creminelli) and they do a lot of business at Eataly. 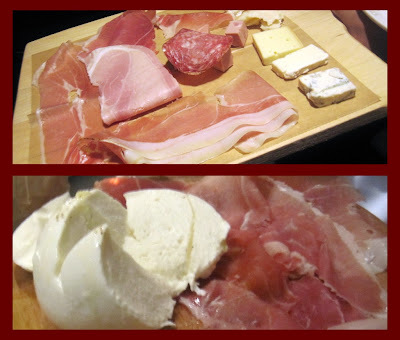 Bring on the salami, the burrata and a hunk of pecorino, please! WOW that looks like heaven on earth LOL! Those chocolates and pastries um YUM! i love new york and i love it most during cristmas! that holiday display was amazing... i looooved it! 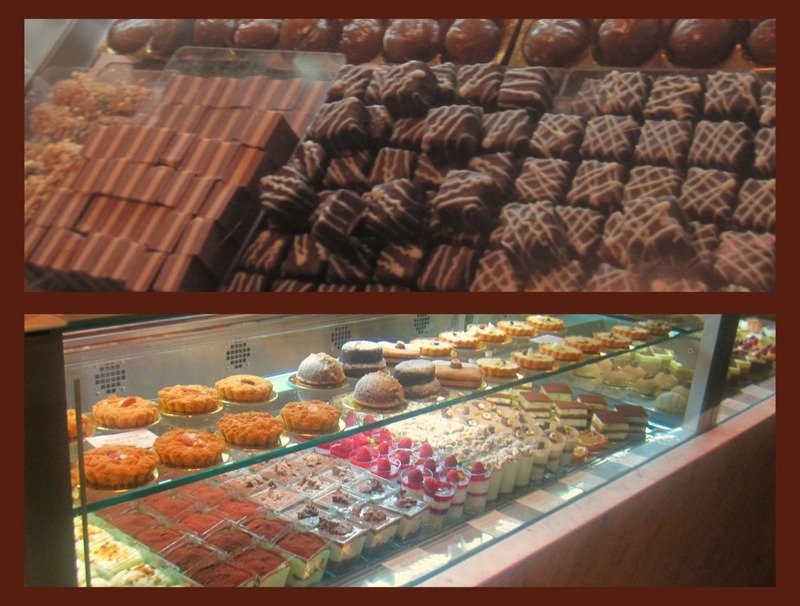 i have never been to eatly, but it looks like my heaven for sure! this wet cheese story makes me sound like I have never left North Carolina. Maybe we should add that I was in 8th grade at the time and that now I am much more well versed in the rest of the world. yes? 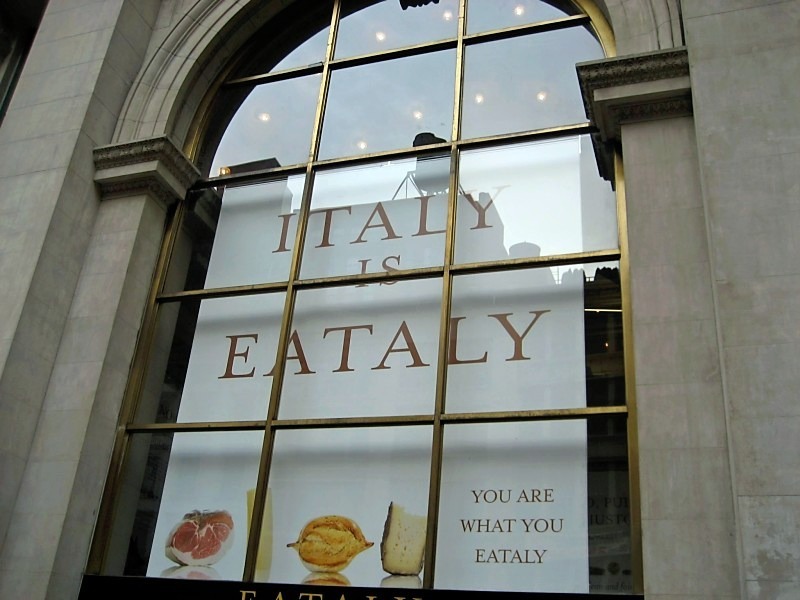 I so want to visit this Eataly one day. Your post is delightful and my desire to go has just increased tenfold.